Monofloral honey is produced predominantly by the nectar of a single flowering plant. It takes the color and taste of the predominant floral varietal and can appear whitish, light yellow, amber, dark amber, brownish, black, etc., and taste floral, fruity, woody, herbal, medicinal, minty, musky or bitter. For instance, a blended honey of 24 percent wildflower, 24 percent alfalfa, and 25 percent cotton with 27 percent orange blossom can be labeled 'Orange Blossom Honey'. As the bees cannot be confined to forage in one area or restricted to just one specific blossom type, obtaining 100% pure monofloral honey is almost impossible. To produce a monofloral variety, beekeepers need to locate the honey bees in a certain region where there is a plentiful supply of a certain flowering plant. Timing is a critical factor as different plants bloom in different times of the year. In addition, beekeepers have to clear the leftover honey from the hives so that the new batch is not mixed with honey produced from different floral varietals. Beekeepers need to harvest the honey once the blooming season comes to an end so that the bees do not go in search of other nectar sources and mix the existing honey in the hive with new flavors. Many consumers assume that the flavor of monofloral is determined by the infusion of the fruit of the plant. But this is not correct. Honey flavor comes from the nectar of the flower. While some honey types taste exactly like their source, Orange blossom honey tastes somewhat like orange, a honey does not necessarily taste like the fruit of the plant. Blueberry honey does not necessarily taste like blueberries, durian honey like durian, etc. There isn't always a correlation. Some honeys are enhanced with artificial flavoring or infused with the real fruit, so read the labels carefully. Worldwide, there are thousands of monofloral honey varietals. As with wine, only connoisseurs are able to detect the subtle differences and peculiar characteristics of some varietals. Even the same monofloral honey sourced from different places could taste different. For example, Manuka honey harvested in Australia is not identical to Manuka honey harvested in New Zealand in its composition. The flavor and color of honey can differ every year, even from the same location and beekeeper. Changing weather can make a difference in the taste of honey. 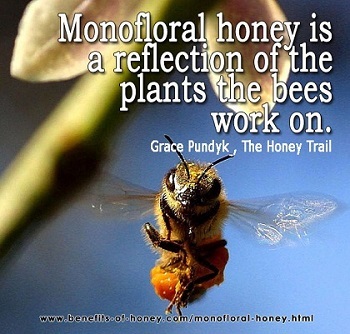 For monofloral honey, the secondary flower nectars present in its composition must have a poor representation so they do not alter or overpower the overall flavor profile and colour of the predominant nectar source. A microscopic anlaysis of pollen grains content in honey can reveal the botanic and geographic origin of honey and pollen. This method is mandatory in the honey qualification procedures in the EU countries. Different monofloral varieties enjoy unique properties that make them stand out in their medicinal and therapeutic potential. For example, Manuka honey possesses an impressive medicinal activity and chestnut honey has an exceptionally high content of dietary minerals. Some monofloral honey varietals are specifically sought for its special abilities to promote wound healing, boosting the immune system, fighting fatigue and hypoglycaemia, improving digestive health, inducing sleep, and treating gastritis. 1) If you are located in Singapore, you can now buy from us honey varietals such as Yellow Box, Eucalyptus, Wildflower, Rainforest, Manuka, Macadamia, and Leatherwood: Buy Honey Online. 3)Most people either swear by this honey or swear about it: An Irreplaceable Tasmanian Honey. 4) A rare and prized honey: Tupelo Honey - Queen of Honey. 5) Many of you love the fragrant roasted chestnuts. But what about the seriously Italian Chestnut Honey? 6) Find out why this honey commands a much higher price and why it is so highly sought after: Manuka Honey? 7) A honey full of macronutrients, trace elements and anti-oxidant compounds: Buckwheat Honey? 8) Pineapple honey and durian honey, two very unique monofloral honey from Malaysia. More in: Truely Unique Honey from Malaysia. End of "The ABCs of Monofloral Honey (Most are Unaware of #2)". Back to "Exploring 35 Honey Floral Varieties (#21 is Highly Sought-After)"